Residential moving is a stressful chore that involves a considerable amount of pre-planning. Commercial moving is even more complex. Relocating a single office or the contents of an entire building filled with office furniture, worker cubicles, inventory, point-of-sale terminals and company records demands the most ardent preparation. A process that can be made easier is by consulting a relocation firm, you can check out this 9kilo moving website here. Now, you can add another task to the endless to-do list. You will need to make certain that your new facilities are ready to accommodate your company’s IT needs. In fact, you should consider having a Houston managed IT services company upgrade your new office with an eye toward possible expansion and your future requirements. Then, as you continue growing, your office will be ready and waiting. Look at it as an opportunity to improve your firm’s ability to adapt to growth and changes in the IT landscape. The physical aspects of moving are daunting and time-consuming, but the logistics are even more critical. You do not want your move to impede your business for even one hour. The relocation will probably be performed over a weekend or when your business is closed. The company’s servers must be taken offline, transported and brought back online at the new location. Your Houston network security is most vulnerable while you subsequently set up your telephone lines, broadband Internet service and offsite storage. Successful IT relocation relies on an abundance of preparation. It is a good idea to increase your network security management as you move so that it will be able to protect you immediately. Consider the fact that some 60 percent of cyber breaches are committed by a staff member. Our own federal government has witnessed an alarming 680 percent escalation in cyber-security violations over the past six years. 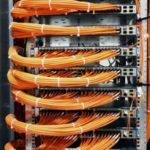 You know how large your new office is, but do you know if the cabling layout is ready for your workers? Our Houston backup and disaster recovery team can examine the blueprints to make sure your vital services will be up and running by the time your office chair is removed from the moving van, including the following list of modern mission-critical components. You need to protect all of your company’s records, including your customer data. Even if your company has its own IT department, an outside adviser with experience facilitating company relocations is a smart investment. Any move comes with unforeseen challenges. Sometimes, it takes a trained eye to notice and handle them. A technician who specializes in office moves can spot potential problems before they occur. Your various departments can voice their concerns and desires to the technician to guarantee that they will be accommodated. Here are some questions that you should consider. Can your IT team support new technologies? Is your data backup system reliable? Do you expect to require cloud-based storage or other services? Is your bandwidth adequate for your needs? Can you purge or bundle any services? You will need to follow a prioritized technology plan that details your requirements before you replace or upgrade your company’s hardware and software. Establish a date for making all final decisions. Include some extra time for testing your system before it goes online. NSC Information Technology Group has an experienced team of technicians who can advise you if you are moving or expanding your company. Call us at 713-974-3889 for answers to any questions you might have regarding your new location. Let us help you design a new company infrastructure. We can make sure that the process involves as little downtime as possible. The key to a successful move is sufficient planning. This entry was posted in Relocation and tagged Houston Backup and Disaster Recovery, Houston Managed IT Services, Houston Network Security. Bookmark the permalink.